Manged & Maintained by a British couple. First Floor of a beautiful Villa. 3 en-suite bedrooms ,very spacious ,beautiful views ,near all facilities . taxi & rickshaws are able to drop you off right outside the villa ,spacious flat roof, with outstanding views, A very large landing with T.V,DVD player, kitchen, fully equipped, dining area, all bedrooms have a safe, ceiling fans, large wardrobe ,drawers ,bedside tables, wall lights, reading lights, mirrors,chairs,2 have balconies, all have attached large bathrooms, with shower, basin, W.C, hot & cold water. 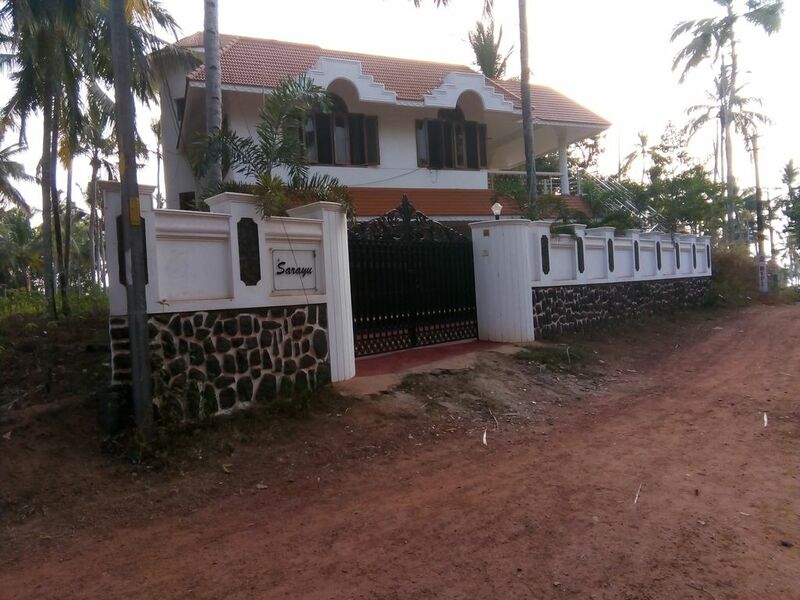 Hello,& welcome, my name is Anil ,I own "Sarayu",but as I am busy working in Trivandrum as an accountant,my British friends manage my property, name of Angie & Den,they will make sure you enjoy your stay,& will be there to answer any questions you might have, & advice you on any trips or outings you might fancy. I was born in India, Trivandrum, & the photo is of me with my lovely wife & son. This property came on the market a couple of years ago, it was a beautiful spacious house, in a great location, within walking distance to most things, a quiet road, very private,& Grow beach was at the end of road, the perfect place for anyone . There are many benefits of this property ,fully self contained entrance,marble floors throughout ,mosquitoes nets on all the windows & doors ,an inverter just in case there might be a power cut, emergency lighting, free WIFI, beautiful views from all 3 balconies, kitchen, fully equipped ,dining area , hot water, cable television, safes in all 3 bedrooms, massive flat roof.